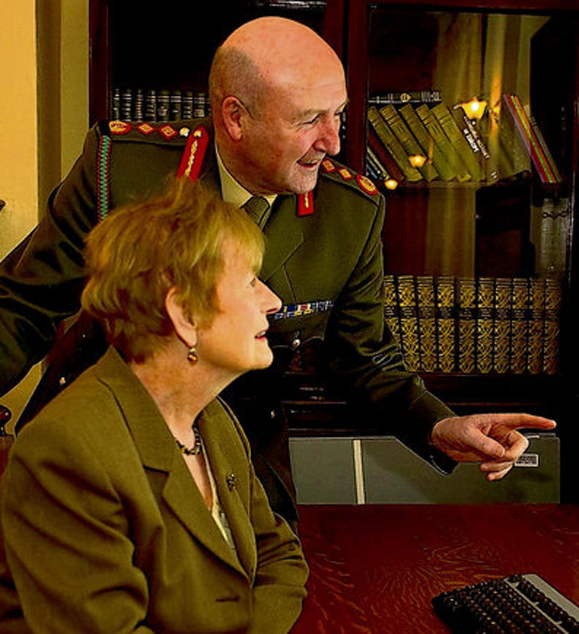 Defense Forces Chief of Staff Lieutenant General Sean McCann shows the new online military archives to Mary-Clare Collins-Powell, the grandniece of Michael Collins. The Irish Armed Forces is about to make a huge volume of historical documents available to the public by putting them online for general access. Lieutenant General Sean McCann, Defense Forces’ Chief of Staff, confirmed that an ambitious project will be carried out with the National Archives of Ireland, placing 36,000 pages of material online relating to military matters for the period 1913-1921. This will cover the 1916 Easter Rising, the War of Independence and will provide a unique insight into events that shaped the creation of the Republic of Ireland. It is planned that the site – militaryarchives.ie – will go online in March. Meanwhile, a BBC Radio documentary provoked controversy by revealing that Irish Army personnel who joined the British Army during World War II were treated as deserters when they returned to Ireland. According to “Face The Facts: Deserters Deserted,” an estimated 5,000 Irish soldiers left the Irish Army to fight alongside the Allies against Nazi Germany. Some of them participated in major military campaigns, including the D-Day landings in 1944. However, it is claimed that on their return home from the front they were dismissed from the Irish Army as deserters, denied all pay and pension rights and banned from state employment for seven years. The program alleges that the names of returned soldiers were circulated on a blacklist in a covert effort to deny them any opportunity at finding work. A campaign group is now seeking to have a full pardon issued to these ex-soldiers. Labor TD Gerald Nash told the documentary-makers, “what happened to them was vindictive and not only a stain on their honor but on the honor of Ireland.” Minister for Defense Alan Shatter was reportedly baffled by the revelations and has sought the advice of the Attorney-General on the matter. My father Michael ORegan from Tralee Co. Kerry Born november 5 1918 served in WW2 for England.. I was wondering was his name on the deserters list in Irland.